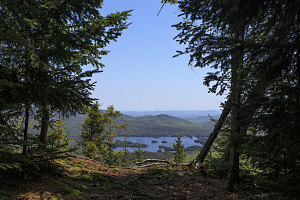 With our upcoming Iceland trip finally prompting us to get some real hiking distance under our feet, we decided on the [Canadian] May long weekend to do an overnight backpack in the Adirondacks. Ewart initiated the whole affair, charting an ambitious 3-day outing. Myself, Jenn and Caroline were interested in two days, so did some co-ordinating, and came up with an intinerary that would allow us to hike together for the first two days, then split off, giving Ewart his third day. 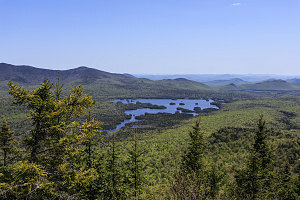 The plan was to hike in the rarely-visited and remote southern section of the Adirondack High Peaks, via the trail leading north from Elk Lake. 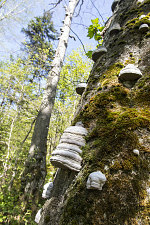 The general idea was for all four of us to hike in to a campspot in the vicinity of Haystack on the first day, then on the second day, Ewart would part ways with us and head over to Marcy and other peaks, while we would go over Haystack and return to Elk Lake. 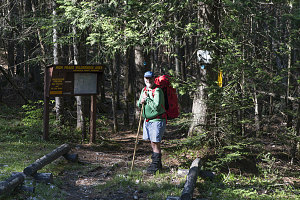 Ewart had slept in his car the night before our start at the Elk Lake trailhead. 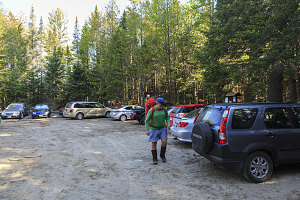 This turned out to be quite fortunate, because as we arrived at about a quarter after eight in the morning, we discovered that the Elk Lake public trailhead was packed to capacity. That would normally mean that we would have to park our vehicle at the overflow area 2 miles back on the road - which would have been a huge drag - but since Ewart had snagged a spot, we could now shuttle one car to the overflow lot and still have a vehicle to get us back here, to the trailhead. We spent a bit of time juggling vehicles, and in the process decided to leave Ewart's vehicle at the overflow lot. Since us three were scheduled to come out before Ewart, he gave us a spare key, and we promised to ferry his car back to the main lot before we left at the end of our backpack (in order to avoid the extra walk down the road for him at the end of his hike). Finally, at about 8:40 am, we were ready to head off on the Elk Lake-Marcy trail under a completely clear and calm blue sky. The forecast for the entire weekend was wall-to-wall sunshine. 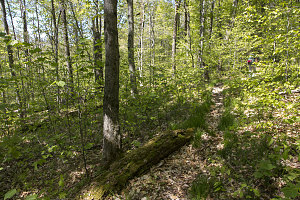 The Elk Lake-Marcy trail is the least travelled of the four major access trails leading into the High Peaks region. As a result, it's got a quiet, unused feel to it: the tread is vegetated and springy, and there's no one else about - usually. 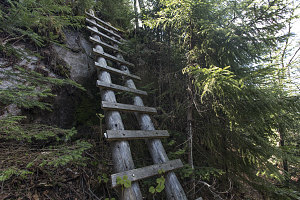 I had only ever been on this trail once before - long ago, in 1999, when Brian, Peter Krug and I did an epic day-long traverse all the way from Elk Lake to the Garden, via the summit of Haystack. 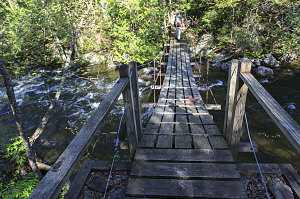 The trail descended for a hundred feet or so down to the crossing of "The Branch" river on a very nice suspension bridge. A few twists and turns brought us to another bridge crossing of Nellie Brook, and then the trail climbed up slightly and started following an old, grassy road. 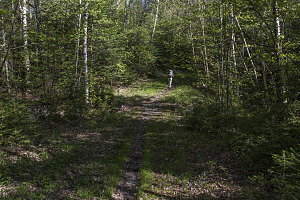 This old road is one of the recreational pathways for the Elk Lake Lodge company, which owns the majority of the land around Elk Lake (The company has granted a right-of-way access for the Elk Lake-Marcy trail across its land). 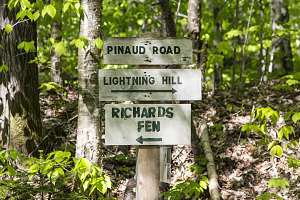 Following the roadway (which the Elk Lake company calls 'Pinaud Road') was an easy and pleasant walk - more than wide enough to accommodate side-by-side hiking. This we did for several kilometres. We achieved quite a respectable clip, covering the first 4 kilometres in just about one hour. 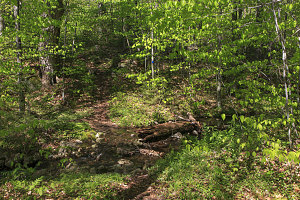 At about the 4km mark (2.5 miles), the Elk Lake-Marcy trail branches off left, leaving the old road and becoming a more typical hiking path. It was still beautifully-treaded and easily-graded. We presently came to a crossing of a delightful little stream - Guide Board Brook, and stopped to do a quick water fillup. We knew that there were many water sources along our route, and as a result we had chosen to bring only moderate water carrying capacity - necessitating water stops such as these. 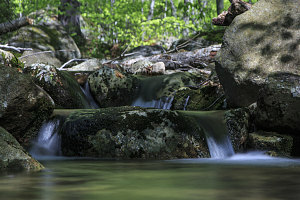 I took the opportunity to take a few long-exposure shots of some of the pretty cascades in the stream. Immediately after the stream crossing, the Elk Lake-Marcy trail started ascending. 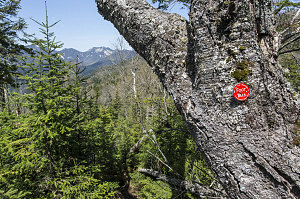 The trail had been nearly flat all the way from the trailhead to this point, but now it needed to cross the spine of the Boreas-Colvin range - a series of moderate, wooded peaks sandwiched between the Dix Range and the central High Peaks. 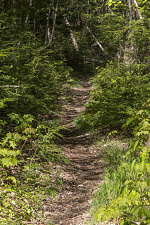 The trail quality went downhill as the uphill grade increased. 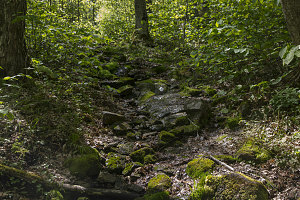 In places, the trail was a mishmash of boulders covered in leaves and with a seep of water running down the middle - and somewhat hard to follow in places. As we neared the first height-of-land across the Colvin-Boreas range, the trail quality re-improved back to a faint but easy path. Presently we reached the 2650-foot saddle that marked the end of the climb up from Elk Lake, and took a good break. After our break, we continued north. 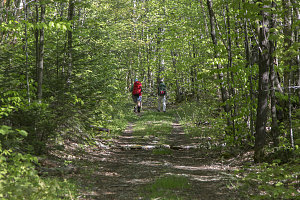 From my vague recollections of thirteen years ago, the trail simply went up, crossed the range, and then headed downhill to the Marcy Swamp area. But this was an incorrect recollection. The trail actually contours around in the hills for a mile or so, heading up and down a few times before crossing another small col and starting the real descent down towards Marcy Swamp. 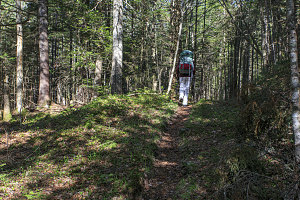 The trail quality was variable - in places pleasant and easy, and in others, rough and sometimes wet and slippery. We arrived at the junction with the Pinnacle Ridge trail - a very rarely-used route that connects over to Blake peak and Mount Colvin. In the spirit of adventure, we had decided to take this as an alternate, somewhat more roundabout way to get to the vicinity of Haystack. 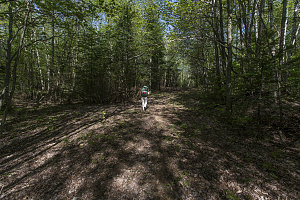 I had never been on the trail before, and liked the idea of exploring something new. Everyone was up for it (in fact, we had already discussed this option while planning our backpack), so off we went. 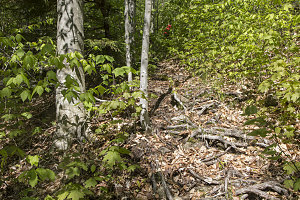 We had heard that the Pinnacle Ridge trail had blowdown, but as we hiked along the first few miles, we did not encounter anything significant. 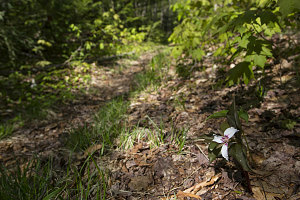 It was, however, fairly overgrown and a bit difficult to follow in places. We passed two passable campsite locations - one near a nice little waterfall. 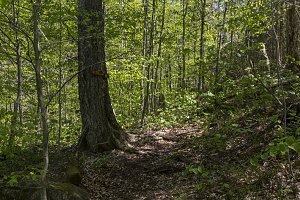 Presently, we reached a signposted turn that marked the beginning of the direct line towards the crest of the Pinnacle range, and the grade got much steeper. We had noticed for the past little while that Ewart was slowing down. He was taking breaks quite often, especially so now with the increased grade. We were in no rush whatsoever, and did not mind at all waiting up for him. After all, we had made relatively good time getting to this point, so we could afford a bit of that. As Ewart caught up with me after one of these breaks, however, he said (in a somewhat broken voice) that he had had enough, and that he'd be turning back to camp at one of the campsites we had recently seen. And that the rest of us should go on and continue our original itinerary. I tried to convince Ewart to continue on with us, at whatever slower pace he felt was necessary, but he would have none of it. This was concerning. We had not done any significant elevation gain - except perhaps for the 300 feet or so since we had started our climb up towards Pinnacle, yet Ewart was - as he likes to put it - completely knackered. I wondered if perhaps he was feeling more unwell that he was letting on. 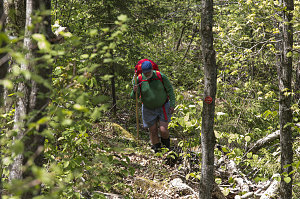 He continued to maintain that he was simply out of shape from lack of hiking. In any case, he had made up his mind, and there would have been a huge kerfuffle if we had insisted on staying with him. Reluctantly, we decided to split up. Before splitting up, though, we established a protocol to coordinate our joint return. Ewart had now decided to exit with us the next day, doing two days instead of three. However, he wanted us to continue with our original itinerary, and meet up with him somewhere along the Elk Lake-Marcy trail the next day. 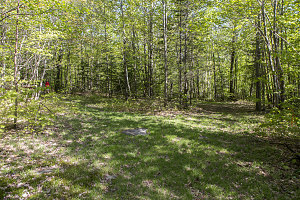 We agreed that he would construct a cairn at the junction between the Pinnacle Ridge trail and the Elk Lake-Marcy trail. If the cairn was present, it would mean that he had passed by the junction and was headed back to Elk Lake. If not, it meant that he was still somewhere along the stretch between where we were now and that junction. With the details of our parting out of the way, I rejoined with Caroline and Jenn on our steep climb up towards Pinnacle. 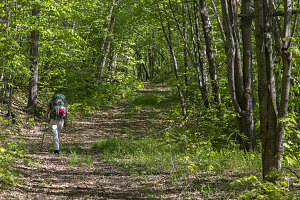 We soon ran into a crew doing some trail maintainence work, moving slowly in the same direction we were heading. We stopped and had a brief chat, noting with some curiousness one trail worker's questions about how the blowdown was on the Elk Lake-Marcy Trail. I wondered, hadn't they come in on that trail just as we had? 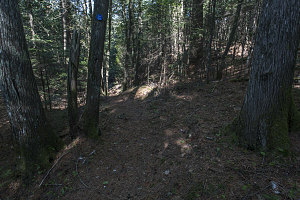 (later I figured it out - they must have been AMR members, and had come up on one of the private AMR access trails from Upper Ausable Lake). 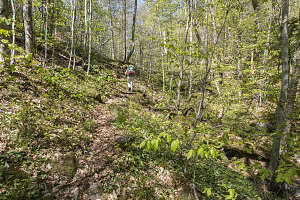 Soon we reached the crest of Pinnacle Ridge, and we were presented with a side trail that led off steeply to the wooded summit of Pinnacle. Jenn and Caroline were less interested in the summit than I was, so I quickly headed off without pack to check it out alone. 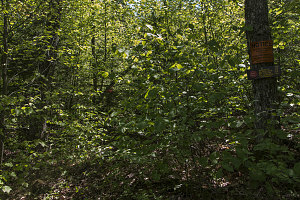 A bit of very steep trail and one long ladder brought me to the wooded summit. There was one excellent viewpoint north to the Great Range, and another even more superb lookout down south towards Elk Lake.